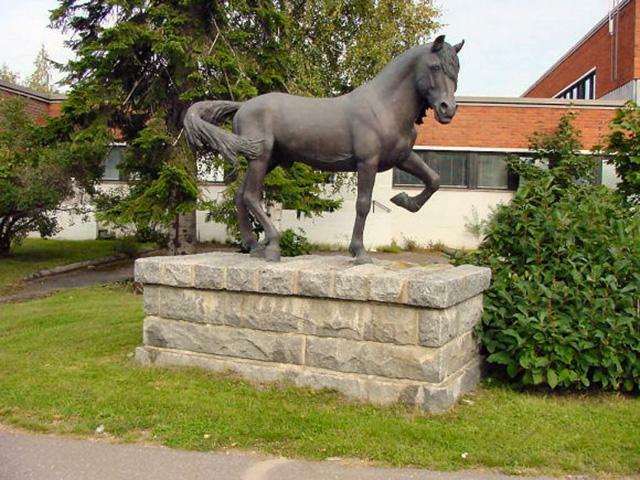 A bronze sculpture by Taru Mäntynen won the competition in honor of the 350th anniversary of Leppävirta in 1989. Four bronze figures on a black granite base depict different time periods and an empty spot is saved for the future. A sculpture made in 1987 by Veikko Haukkavaara, "Kaakanat" is located in front of the Leppävirta Health center. An ore stone from the Kotalahti mine in Oravikoski, was brought to the Vesileppis grounds in 1977. A sculpture made by Pekka Paikkari, located in the roundabout at Kalmalahti. A joint project by Hackman, the parsih and local Transports and Communications precinct in 1997.
after the municipality of Leppävirta was founded in 1639. Guard of Leppävirta in 1921.
died because of their beliefs in 1918. Designed by architect Juhani Nylund in 1965. A memorial for the shipwreck of the Steamboat Louhi. shipwreck took place on 15th of May 1934 on Lake Suvasvesi. 30 people drowned, of which 22 were from Leppävirta. and Hannes Pursiainen on the foundations of a basement. to a stone brought from the Konnus canal area on the anniversary of Kalevala in 1985. The memorial plate of Secretary of State Pentti Pekkarinen, located on the wall of the city hall. The memorial plate of parliament member Otto Johannes Lundson, located on the wall of the city hall. The memorial plate of people who fought in the Winter War and the Continuation War, located next to the Leppävirat market place and made out of copper. The memorial plate for the Finnish White Guard, Lotta Svärd, Sotilaspojat and Pikkulotat organizations. This plate is located on the wall of the canteen of Kivelä school as the building originally functioned as the house for the White Guard. The memorial plate for the Mannerheim Cross knight number 36, Aarre Alfred Voutilainen. The plate was revealed 6.12.2005., is designed by Pentti Laukkanen and was manufactured in Lapinlahti Taidevalimo. This plate is located on the wall of the canteen of Kivelä school as the building originally functioned as the house for the White Guard.